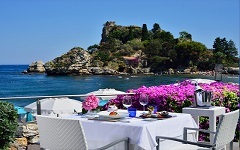 La Plage Resort, one of the best 5 star hotels in Taormina, is located right in front of one of the most interesting swimming destination of the area: the Isola Bella, a former private island that during the years following the 1990 has been bought by Sicily region to be turned into a nature reserve. Located just few meters from the nature reserve's limit the Ragosta Hotels Group presents one of its pearls of hospitality, the La Plage Resort that within its 61 rooms divided in bungalows and suites, encloses all the comforts of the best 5 star hotels Taormina. Book now your stay at the La Plage Resort and discover the pleasure of living a holiday in one of the most famous destination in Sicily just a step out of its hectic nightlife and surrounded by a luxuriant nature: only from the best 5 hotels Taormina can be enjoyed at its best!